With the advent of the Industrial Revolution in the 19th century, the world moved fast towards better living—terming it as growth—but at the same time, degrading the purity of nature in all forms. The Stockholm conference held in 1972, on “human environment” brought to light the urgency of tackling environmental problems through various efforts. Environmental protection measures have become necessary for development and to sustain environment at the same time. It is all the more important for India where economic development is necessary to meet the growing demand of people. However, indiscriminate degradation of environment in the name of economic progress is unwarranted. A balance has to be struck between industrial progress and environmental degradation which is caused primarily by industrial pollution. Looking at the need for a rapid pace of growth on a sustainable basis in India, new enterprises backed by latest technology should be set up in new areas including uncultivable wasteland. Sustainable development is a multi-dimensional concept with three interacting aspects—ecology, economics and ethics. The conditions necessary for achieving sustainable development are ecological security, economic efficiency and social security. Sustainable development does not end with sustainability of environment and resource system; it also requires the sustainability of economic and social systems. Development and environmental protection can easily go together but perhaps not at the pace that governments want to set. It would be better to begin new projects with built-in environmental safeguards rather than make haste only to repent in leisure. Growth without environmental safety can prove counter productive in the long run. The Bhopal gas tragedy is still fresh in the minds of the people. Unfortunately, no fool proof measure has yet been devised to cope with such unforeseen accidents which is very necessary to safeguard the health of the people living near the plants. Clean technology essentially means production process that minimises use of raw materials and produces minimal waste. Globally, environmental trends are reshaping the industry. There are plenty of examples of clean technologies round the globe. The clean technology has not only reached to commercial sectors but also grabbed the residential sectors. The growth in clean technology industry will definitely help in making sustainable and safe environment for next generations. Latest BP Energy outlook indicates that India’s demand for green energy is expected to grow seven times by 2035, and the share of renewable energy in the country’s fuel mix will increase from 2 per cent to 8 per cent in 2035. While coal and other fossil fuels will continue to play a major role in India’s energy mix in the decades to come, it is committed tackling climate change. India’s Intended National Determined Commitment (INDC) targets to install 175 gigawatts (GW) of renewable energy capacity by 2022 (out of this, 100 GW has been allocated to solar and 60 GW to wind) by setting a new target to increase its share of non-fossil based energy from 30 per cent today to about 40 per cent by 2030 and commits to reduce its emissions intensity per unit GDP by 33 to 35 per cent by 2030. Apart from increasing share in green energy and adopting latest technologies in fossil fuel plants, a host of measures are being undertaken to reduce India’s carbon footprint. India’s installed capacity of diesel generating sets forms a third of its total grid connected capacity. Toxic fumes emitted by burning diesel in DG sets have serious implication and power generation is also expensive. As a deterrent, incentives for both capital investment and power generation by solar rooftop have been encouraged. Various policy inducements have translated into lower generation cost. Despite all these advantages, solar rooftop has not yet picked up. Tariff for solar power have fallen to record low due to government’s solar energy drive aimed at reducing greenhouse gas emissions.The gap between the thermal power and solar power has been narrowing. 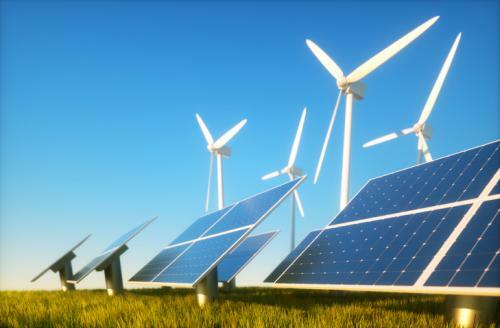 International Energy Agency (IEA) claims that clean energy technologies and policies can indeed meet multiple objectives in the most effective way. For example, sustainable mobility solutions can increase access to services while reducing congestion and increasing productivity. Efficient building technologies can reduce energy investment needs while increasing comfort for residents. Local sources of energy and integrated distribution systems can decrease the costs associated with delivering various services, while improving resiliency and flexibility. Recent years have shown how progress can be achieved, but major challenges lie ahead. With CO2 emissions stagnating for the second consecutive year in 2015 despite a growing global economy, we now have proof that sustainability and growth can go hand in hand, but the uncertainty associated with lower fossil fuel prices may tempt policy makers to act based on short-term opportunities (Tracking clean technology progress,2016,IEA). The Global Burden of Disease, a global research programme, has estimated that 3,283 Indians died per day due to outdoor pollution in 2015 making the potential number of air pollution deaths in India to 1.198 million that year. Greenpeace India’s report claimed that none of 168 cities it assessed complies with air quality standards prescribed by WHO. The report observes the deaths are only a “fraction less” than that caused by tobacco usage adding that 3 per cent of GDP is lost due to air pollution which is primarily caused due to economic activities. Countries cannot overlook safety and public health aspects of projects. Owners need to disclose risk information on operations that would endanger public health, safety and environment on the production, sale and export of goods that could be harmful to people and environment. Central or state governments should press for such information from international and national agencies dealing with industrial hazards and pollution. At the operational level, the industries have to be closely monitored by a responsive and competent environment management group. State Pollution Control Boards (SPCB) function at sub-optimal levels due to lack of infrastructural and financial support. There is an urgent need to strengthen SPCBs, by recruiting professionals from various disciplines and provision of infrastructural support. On the other hand, functioning of SPCBs at local levels has to be monitored by high-powered independent groups periodically in order to enforce accountability among officials. Region-wise institutional framework should be set up so states will monitor air quality, environmental standards and environmental issues and also suggest corrective actions. I agree with Mr.S. lahiry. Maybe continuous writing on the subject of clean technology , will build more awareness.